University of Lynchburg President Dr. Kenneth R. Garren will receive a national award from the Council of Independent Colleges on Monday, May 2. 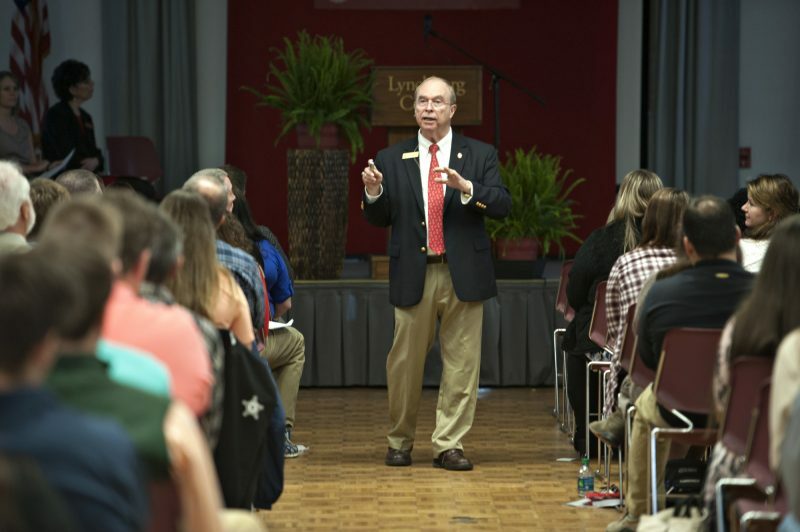 Dr. Kenneth R. Garren speaks to prospective students and their parents about the value of a University of Lynchburg education. The Charles W.L. Foreman Award honors Dr. Garren’s commitment and service to the CIC and the Virginia Foundation for Independent Colleges. In his 15 years as president of University of Lynchburg, Dr. Garren has worked to promote independent colleges and advocate on their behalf to both state and national policy makers. In addition to playing a major role in programs such as the VFIC Ethics Bowl, he has worked to protect the Virginia Tuition Assistance Grant and oppose federal measures that would have proven detrimental to college students. Meanwhile, LC has benefited from Dr. Garren’s vision of a growing college that stresses professional preparation rooted in a liberal arts curriculum. Read more about Dr. Garren’s 15 years at LC in the Spring 2016 University of Lynchburg Magazine. Read more about his selection for the Foreman Award in this October 2015 news release.